Your builder wants you to build the very best house. Be patient and persistent if he is unfamiliar with our product, but ask for spray foam insulations produced by DEMILEC (USA). What is open-cell (semi-rigid) polyurethane spray foam insulation? Does it adhere to metal studs and is it compatible with other building materials? Does it break down, shrink or sag? Are there any issues about overheating of electric wiring? Does it support the growth of mold and mildew? What about pests (e.g. roaches, ants, mice and termites)? What is the R-value of open-cell (semi-rigid) spray foam insulation and is that an aged value? What are the acoustical properties? Does it contain urea, formaldehyde, CFCs or HCFCs? Are there health concerns associated with the use of open-cell (semi-rigid) spray foam insulations? At what stage of construction is it installed? Can it be applied in an existing structure? Who is allowed in the general area during application? Is it possible for owners to install this foam themselves? What�s the difference between the SEALECTION� product line? Open cell (semi-rigid) spay-applied polyurethane foam insulation systems (0.5 lbs/ft�) are made up of million of microscopic cells that simultaneously insulate and air-seal. They make residential and commercial structures more energy efficient, comfortable, quieter and less dusty. Open-cell insulation is applied as a liquid, which expands into a semi-rigid mass, automatically sealing off drafty areas such as baseboards, headers, sill plates, around windows, doors, electrical outlets, pipes, etc. It also minimizes uncontrolled air leakage throughout the building envelope (wall, ceilings, etc. ), thereby reducing energy losses and the possibility of mold, mildew and premature decay. Open-cell (semi-rigid) spray foam insulation remains flexible throughout the life of the building. As the building expands and contracts with changes of season and temperature, it will move with the changes without destroying the seal. As well as simplifying the construction process for the builder, open-cell spray foam insulation eliminates the major causes of building envelope problems - airborne moisture movement and entrapment. Heating and cooling costs are typically reduced by 30-50%, and more money can be saved by purchasing a (properly sized) smaller, less expensive HVAC unit. Soundproofing is another benefit that is quickly appreciated in areas such as plumbing runs, media rooms and offices. Open-cell spray foam insulations produced by DEMILEC (USA) adhere well to steel studs and other natural materials such as cement board, wood, etc. Since open-cell insulation will adhere to almost all surfaces, areas that do not require spray foam insulation (such as windows, doors etc.) must be protected from overspray. It is stable in the presence of most solvents found in binders, bituminous materials, wood preservatives, and sealers. It is resistant to facers containing plasticizers, fuel, mineral oil, weak acid, and weak bases, which are typically found in residential and commercial construction materials. 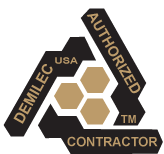 Open-cell spray foam insulations produced by DEMILEC (USA) are non-corrosive and neutral (neither acidic nor alkaline) and will not cause corrosion to metal studs and other metals typically found in construction. The reaction that created the open-cell spray foam insulation is irreversible, preventing the breakdown into its constituent parts. Therefore, open-cell spray foam is stable and will not shrink or sag. Open-cell spray foam insulation offers no food value. Therefore it cannot support bacteria or fungal growth. The effective air-sealing characteristic prevents the movement of hot air to the cold parts of the walls, preventing condensation from taking place within the wall cavities. The elimination of condensation within the wall assemblies prevents the growth of molds and mildew. Open-cell spray foam acts as a physical and odor barrier that has shown to significantly reduce the number of pests entering structures. It offers no food value, and while it by itself does not present a concrete entry barrier, pests normally do not attempt to go through an area where they cannot detect a food source. The R-Value is rated at 3.81 ft2.h�F. In a nominal 4-inch wall, the R-Value is about R-13; in a 6-inch wall, about R-21. Unlike foams filled with CFC or HCFC, the R-Value of open-cell spray foam insulation does not decline as it ages. R-Values of insulating materials are measured in laboratories and are designated a nominal R-Value per inch. In the wall or ceiling of a building most factory-made insulation materials suffer a reduction in performance due to air leakage and infiltration. The insulating value of many building components may be as low as 50% of the nominal R-Value of the insulation they contain. By contrast, the insulation of a wall containing spray foam insulations produced by DEMILEC (USA) Insulation will perform closely to that of the laboratory tested R-Value of the material, and it seals the wall cavity from air infiltration as well. The spray foam insulations produced by DEMILEC (USA) are particularly suited for steel or wood frame construction. Open-cell spray foam insulation expands 120:1 as it is installed, adhering to surrounding building components. It completely seals joints, crevices and voids, including difficult-to-insulate spaces such as steel stud "U" and "C" sections, double studs, and non-standard stud locations. Open-cell spray foam insulation has excellent sound absorption properties and sound transmission properties. When comparing spray foam insulations produced by DEMILEC (USA) to other insulations, there is a very noteworthy difference. As an effective air seal, they eliminate the air gaps through which sound travels easiest. In addition to controlling all frequencies, they are superior in controlling mid-range frequencies that include the most common sounds - the human voice and stereo music. No, open-cell spray foam insulations produced by DEMILEC (USA) do not contain urea, formaldehyde, CFCs or HCFCs. Among other approvals, SEALECTION� 500 has obtained the seal of approval from the EcoLogoM (formerly Environmental Choice) Program of Canada. Open-cell spray foam insulations produced by DEMILEC (USA) are "green" products. They meet off gassing requirements of CGSB 51.23 92 for new residential construction, and no toxic or carcinogenic products were detected. In addition, the use of open-cell foam insulation reduces airborne dust and air infiltration, making it the healthy choice for those who suffer from allergies, asthma or chemical sensitivity. In new construction, open-cell spray foam insulation is installed after the windows, doors and roof are in, the electrical and plumbing inspections are completed, and after any other electrical or mechanical system located behind the drywall is installed. It is the last installation to take place before drywall is installed. Excellent results are achieved in using open-cell spray foam insulation in the attic and in the crawl space (if applicable) without disturbing the walls in a retrofit application. The reason is that a large portion of a building�s energy loss is caused by the "chimney effect" - hot air rising therefore creating air movement within a building. For existing walls, a "pour-in-place" formula of our foam insulation is preferred. Spray foam insulation is used in walls where drywall has yet to be installed. Open-cell spray foam insulations shall be installed on site by certified installers who have been trained in the proper safety and handling of the chemicals. Other persons should keep away from the immediate area where spraying is conducted. The installer must be a factory-trained and certified contractor using specialized proportioning equipment. The installer has been trained to work with the chemicals involved and has also been trained in a building science to provide the best installation possible. In reality, open-cell spray foam insulation cannot be compared to conventional insulation. Open-cell spray foam insulation actually air-seals the building end eliminates energy robbing air leakage and the associated problems with moisture, mold and mildew and condensation problems inside the walls. When calculating the actual cost you need to consider the possible need to downsize the HVAC systems, eliminate building wraps, and eliminate a significant portion of the material and labor costs associated with an air-sealing approach. The investment to upgrade from standard fiberglass is an insignificant part of the overall cost of a home and your long-term energy costs. When you are planning to install an upgraded insulation package, remember that the spray foam insulations produced by DEMILEC (USA) are initially more expensive but provide you with the best performance and comfort value in addition to long-term savings. The additional upfront costs typically pay for themselves in energy savings within three years and will keep on saving you money every year thereafter. SEALECTION� 500 and SEALECTION Agribalance� are both superior water-blown, open-cell spray foam insulations, and perform equally well. SEALECTION� 500 is our premier product while SEALECTION Agribalance� is the next generation that contains more than 20% renewable agricultural-based materials (refined vegetable oils) in the resin. Send mail to info@igloofoaminsulation.com with questions or comments about this web site. Copyright � 2019 Igloo Foam Insulation, Inc. .